Your comprosser is in a class all by itself, and believe me I have tried them all. What a great idea to have both pedals in one unit. And I forgot how important the Orange Squeezer was. I love all music and when I was growing up the radio had some Super Guitar Players. Now back then they did not have tube screamers and fulldrives. Most of the guys used compressors. And I remember reading a lot about the OS. Do you remember Strawberry Letter 22, Jackie Blue, Midnight at the Oasis, You're no Good? They all relied on some form of compression. Nine times out of ten in the 70s it was an OS or a Dyna-Comp. I have been playing out for 20 years and of all the effects, a compressor has always been my secret weapon. My rig in the 70s was a Polytone with a switch blade to channel switch, a Boss Chorus Ensemble, and a Dyna-Comp. The Polytone was incredible and had a great distortion tone. The clean tone with the Dynacomp was to die for. In the 80s I went to a stereo Marshall setup with the Dynacomp as well. In the 90s I thought I found the holy grail- the Carl Martin compressor. It is a great compressor but sometimes four knobs can be confusing. A couple of years ago, I read about your mod so I sent a new Dynacomp to be modded. In less than 4 gigs the jacks went bad and Dunlop refused to send me new ones under the warrantee. And I was a dealer at the time, well the tone did not convince me so I sold it on e-bay (In less than 24 hours no less). Analogman has a lot of clout/fans. I guess I should have pulled my old dynacomp out of storage and had it modified, but the Dynacomp is just too noisy. So since I am so into your site, I look at it from time to time and when I came across the new handmade comprosser combined with the legendary OS I had to give it a try. My verdict- STELLAR. I can not possibly thank you enough for sticking it out and following through with this Milestone in guitar advancement. In my opinion it is a gift to us as guitar players as well as a major contribution to the effects world. It has been ushered in with no full page ads or major unveiling at the NAMM show, just humbly offered on a honest American's webpage. Mike I salute you and thank you for this treasure. Evertime I play I know my sound will be sparkly, sweet and funky. Keep your no comprimise attitude and if chips are not available make us wait. You know what is best, I know the time I waited for this pedal was worth every second because I will have it the rest of my life. This is an email I received in late 2001 from a customer who is a veteran professional, playing in the Las Vegas area. He plays all sorts of music at the many clubs in Las Vegas so he needs many different sounds. 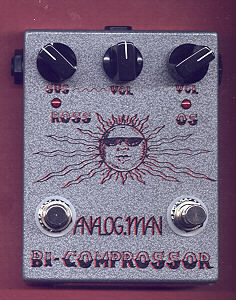 I am not a huge pedal or effects kinda guy, but I wanted to let you know how awesome the BiComprossor pedal is. It gives me amazing tone and punch. I have ten amps and six guitars. So far I have played single coils (Strats) and humbuckers (Baker RF models) with a Roccaforte 18 watt 1X12 combo and my Victoria 35210 (like an old Fender 2X10 Super). Both amps are clean machines, but can be cranked to produce nice overdriven tones at higher volume settings. With the BiComprossor running the Juicer and/or the comprossor, I can get great tone and sustain at lower volume (nice for bedroom players and small club players). Tone is very rich and "real" - no artificial sound or garbage at all like so many other pedals (the reason I stay away from pedals). Very nice - the best pedal investment I have ever made. Congratulations on an awesome product. Unbelieveable service! I do not find any words for that. The bicomp has just arrived and i can't get the smile out of my face. But take a look at the picture and guess what comp i'm using at every job since last August..... not anymore. Finally got to give the mini bicomp a spin last night at rehearsal. I have but one thing to say...FAT! We are doing a set of jazz/fusion/blues stuff at an upcoming festival and I was really looking forward to having this on the floorboard. I pulled out a Yamaha SA1100 335 style guitar and played it thru the bicomp with the Juicer running and then thru the ts9/808/silver and into a '64 Deluxe Reverb. WOW!!!! The Juicer really fattens up the tone. I mean that guitar straight in to that amp sounds pretty darn great as it is, but geeeez! Think Larry Carlton circa Steely Dan Royal Scam, which was a pretty good period of tone for Larry. 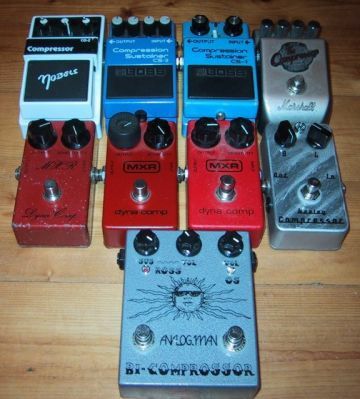 I believe that he actually used a 335 thru a dynacomp and a distortion + into a tweed Vibrolux. It's that sound all over again here! The comp side sounded really great with my strat as well. Very VERY pleased! :-) Thanks! I've received the mini bicomp about a week ago. I didn't want to send you this mail too early, just to make sure I would have played a good many hours before I drop you a line... I'll try to keep it short. Usually, I don't think it's any use really to comment on stuff I buy, particularly to a seller, but this a - very - unique case. I don't need many stompboxes, I usually only plug a compressor and use my amp and fingers to do the rest. I've never been really satisfied with stomp compressors, mostly because every unit I tried had the same problem: if the threshold (whatever it'd be labelled) was set right to work with low notes, it would leave high pitched ones more or less unaffected. If it was fine for hi licks, low picking would be pumping and muddy. No way to snap from one end of the neck to the other. Well, let me tell you this: your mini-bicomp is the most intelligent, the best crafted, the juiciest, simplest and yet most versatile unit I could ever dream of. I play for a living now. For 22 years, I've tried to get closer to the sound I had in my head. I just made a giant step in that direction and I owe it to you. Mister AnalogMan, I salute your craftsmanship and dedication. Thank you from the bottom of my heart. So I just picked up an analogman compROSSor, and I'm damn pleased. I bet you all had already figured out that compressors are pretty great ... here's my thoughts on the matter. In recording, I'm all crazy with the compressors. It's like salt when I'm cooking -- I add a little at every step, all the time. The one place I've rarely used a compressor is between the guitar and the amp. Seemed to me that a guitar amp, especially a loud one, is a pretty good compressor all on its own, and what was stompbox going to do for me that wouldn't be better done with better units once the track was down? Well, I've seen the light. Set very gently, the compROSSor's doing at least a couple things really well. First off, it's a pretty successful limiter, making up the volume shift between single-note play and strummed parts, even with the compressor set below 9 o'clock. For live performance the compressor seems especially useful this way. I won't need to dial back on the vol knob, and so I won't be sending half my treble to ground everytime I start to strum. The other thing the pedal's doing is just bringing the whole sound forward. Like in recording, gentle compression has that strange effect of making the sound seem closer to you. Like anti-reverb. The amp's inherent compression, while providing some degree of limiting and balance correction, doesn't do this at all. One thing the pedal does have in common with amp compression is an appreciable boost in the harmonic content. At my preferred very mild settings, I'm not noticing gobs of sustain particularly, but I am hearing more of the overtones and bit less emphasis on the fundamental -- that's gorgeous. I tried it in a couple positions, and for now I'm liking it after my gain pedals and after my choralflange. Putting it after the dirt does two things -- it lets you still control the amount of dirt using your volume knob, and it contains crazy volumes spikes like I sometimes get from a fuzz pedal. The downside is that can't get a real volume boost out of the dirt pedals, gets limited out in the compressor, but that's not what I'm looking for anyhow. Seriously, THIS is what I'd always hoped a compressor could do. I've long searched for a box that would even out my dynamics without killing the punch, rolling off the highs, or sounding like an effect was in line. Having gone through the usual suspects -- Boss, MXR, Carl Martin, brand K, -- I never found anything that sounded right to me. With the Juicer, the search is over! I'm not an engineer and have no idea how the circuit differs from the others, but the Juicer does it all. It brings up the soft parts just enough, the "squash" on hard transients sounds entirely natural, and the treble shines through. The subtle mid-boost is a total plus, as it adds a dimension that contributes to the "can't turn it off" syndrome. Thank you a million times over for producing this wonderful tool. You rock!! Have a great day. After buying who knows how many pedals of all types, makes, etc., this pedal is the most accurately represented I have ever bought. 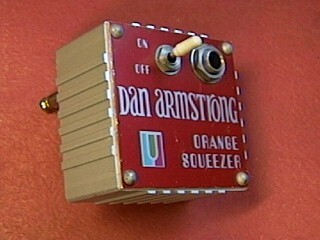 It is exactly how described and a thorough (and improved) re-generation of the Orange Squeezer. The sound and feel is perfectly accurate. It sounds fantastic....compressing the attack but letting the tail through without squashing the treble out of the signal. (That, in itself, is an amazing and rare feat). It adds wonderful sustain and a particular singing musicality when working with overdriven tones and settings. Thanks for making a truly exceptional unit!